If you’re lucky enough to be planning a wedding for spring time, then you’re working with amazing conditions. With winter dwindling away, people are going to be raring to get out and enjoy the milder temperatures. Parkas off, sports coats and dresses on. Spring is one of the most popular times for couples to get married, and it’s easy to see why. Planning a wedding can be complicated and stressful, and nobody wants to add “sweating my makeup off” to the list. Come autumn, you can’t be sure you won’t be hit with an unexpected cold snap that will hinder your guests from even getting to your wedding. Spring may be idyllic, but there are still factors to consider for this particular season. 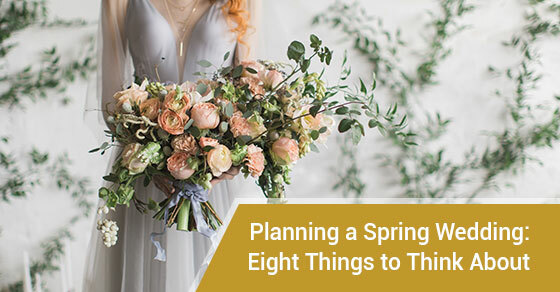 From April showers to springtime flowers, there’s a lot to think about if you’re planning a spring wedding! Temperatures may be mild in spring, but precipitation can be a doozy. As they say, March comes in like a lion and goes out like a lamb. April showers bring May flowers. Basically, it rains a lot in spring. This is a big factor to consider if you’re planning an outdoor wedding. There should be an emergency shelter in case the rain starts pouring halfway through your ceremony. Even if the weather report doesn’t call for rain, snow, or anything else that will wreak havoc on your vows, have a large tent or other structure that can cover everyone if need be. You can’t depend completely on your local weather report, as weather can change so quickly in springtime. It may not rain on your wedding day, but it may have rained the day before. If there was a downpour the week of your wedding, there may be significant changes to the ground outside. This is something to think about if you want your version of walking down the aisle to be strolling down a lush lawn; likewise, if you’re planning an outdoor reception. A solution to the uncertainty of stable ground is to bring portable flooring. This creates a solid foundation, regardless of weather conditions. Getting your stilettos stuck in the mud is not what you want to remember from your wedding day. Part of the beauty of spring is all the flora coming into bloom. If you’re enamoured with the idea of a spring wedding, take it to the next level by incorporating flowers famous for blossoming in spring. Peonies, tulips, and daffodils are gorgeous and are synonymous with spring. One of the upsides of going for springtime buds is economizing on the flowers portion of your budget. Purchasing flowers in season will be less costly than when they’re not naturally growing in the local area. As a rule, anything you have to import will cost commensurately more. Have you ever thought of using umbrellas as wedding decor? They’re cute and practical props that can be customized to your wedding’s colour scheme. Your guests will appreciate the adorable touch if it’s sunny out; they’ll appreciate you equipping them if it rains. Practical decor does double duty: paying homage to the spring season, while providing a backup plan if the weather takes a turn. Other examples of soft, lovely, and useful decor are flowered verandas and transparent canopies. A generously draped fabric shelter can be visually stunning, and also provide shelter from the elements. Just because your wedding is taking place in the spring, it doesn’t mean you have to go for a predictable colour scheme. Otherwise, your wedding will be just another blip on the spring pastel radar. Don’t be afraid to experiment with bold hues and unorthodox pairings when coming up with your colour scheme. Go as glam as you want by incorporating metallics, or go for a buttoned-up look with colours such as navy, black, and white. Think outside the spring pastel box for your wedding aesthetics if you want to be more daring. Springtime weddings tend to be casual; with the temperatures warming up, people are loosening up too. Forego formal wear for an outdoor spring ceremony; it’s just not the right setting. You can let your guests know it’s okay to embrace some whimsy by adding a note to your wedding invitations that casual attire is alright. In fact, let them know to dress for the conditions. Sometimes winter can make a sneak appearance again, just when we thought we were fully into spring. You don’t want your guests shivering while you’re up there at the altar. Part of the reason to have a wedding in spring is to host it outside. An outdoor wedding has a sweet, gorgeous, and natural feeling and can be much cheaper than doing it inside. And there’s just nothing like looking into your partner’s eyes and saying “I do” with the blue sky in the background and the sound of the birds in your ear. Planning a spring wedding will be one of the most fun and exciting challenges you’ll ever take on. To be sure, it is just that: a challenge. Make sure you plan for the weather, just in case mother nature gets so emotional that she cries all over your ceremony! And enjoy thinking outside the box in colour schemes, decor, and facilities. Your spring wedding will be gorgeous, and everyone will be able to enjoy the cake, dancing, and love without the elements crashing the party. Le Jardin is Toronto’s best when it comes to wedding venues. Our stunning gallery proves it, as do our countless client testimonials. Entrust your wedding day to the top event venue in Toronto, and let Le Jardin be your backdrop. To book an event, call Le Jardin at (289) 236-2572 today or visit us on-site at 8440 Hwy 27 in Woodbridge, ON.